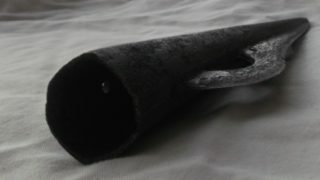 The Moyarwood spearhead was found during the cutting of turf in 1946. Galway County Council brought the find to the attention of the Archaeology Department in University College Galway. The find location was inspected but no archaeological features were associated with the spearhead. 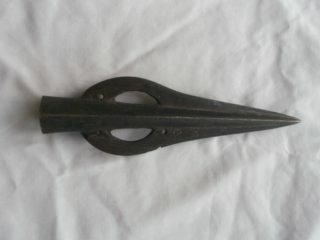 This spearhead is described as leaf shaped. It measures 232mm in length and 62mm maximum width. Asymmetrically placed lunate openings occur in the blade. There is a small circular perforation above one opening and below another. There are peg holes in the socket immediately below the blade. The socket mouth is of hexagonal cross-section. Socketed spearheads like this date to the Early Bronze Age. Technologies for their production came after the flat dagger-like blades. Socketed forms would make a stronger implement for battle. There has been a vast quantity of Bronze Age weapons found in wetland areas, lakes and shorelines throughout the country. Hoards of copper, bronze and gold have been found in bogs, lakes and rivers, some of which may have been part of votive offerings to the Gods. Some may be assemblages for re-use, or hidden from pillagers. A knife was reported to have been found with this spear-head, indicating that they may have been hidden together for later use. It is thought that the Bronze Age was a time of great civil unrest due to the vast amounts of weaponry associated with the period. This weapon may have been used in battle or for ritualistic use or a status symbol. For more information on Spearheads and the Early Bronze Age follow this link to The National Museum of Ireland Website. Should you come across a stray find while cutting turf/ploughing/excavating take a note of its location and contact your Community Archaeologist or The National Museum of Ireland. All stray finds are recorded on a county by county basis in the topographical files housed in The National Museum of Ireland, Kildare Street, Dublin. All finds belong to the people of Ireland and the National Museum is the custodian for these. Please note the map displayed only identifies the townland of Moyarwood. This is not the find location. This page was added on 26/06/2017.